Former UNP Parliamentarian and Speaker W.J.M.Lokubandara addressing the media at the President’s Office. Picture by Sudath Malaweera. 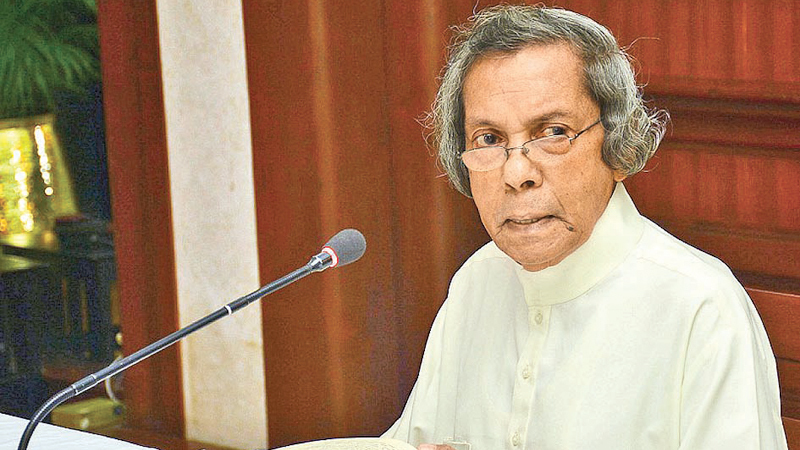 Former UNP Parliamentarian and Speaker W.J.M.Lokubandara said the Constitution is sovereign and misinterpreting it to suit one’s political or personal interest, would be damaging and can have serious consequences. “Democratic sovereignty was established after colonial powers left the country and is clearly well protected under the Constitution, and there is no need to trumpet somebody’s atypical wanting for it on account of his manifold political troubles ,” he pointed out. Lokubandara said he was ashamed by the actions of UNP Parliamentarians and former Prime Minister Ranil Wickremesinghe that they have resorted to begging sovereignty and freedom from Western unions when they already have it. The former Speaker from 2004 to 2010 speaking on the current political situation said he regrets about it as a person who held the post of Speaker. He said that he had never visited UNP party headquarters, Sirikotha during his tenure as Speaker. “I conducted myself like the mace in Parliament and treated every member in the House as would a father,” he reflected. I contemplated how wrongful would it be to mislead them, and gave them leadership when and where it mattered. My guide was the Constitution,”he said. “I have never held any political meetings or carried out any political activity from my official residence during my tenure as Speaker. “I thought it is my duty to tell the country that the 19th Amendment to the Constitution has no bearing whatsoever on Article 70 of the Constitution, which clearly states that the President has powers to summon, prorogue and dissolve Parliament. “The President has exercised his power to prorogue Parliament. In fact he can prorogue it for two months if he likes,” he said. Acting against this would be a violation of the Constitution that may call for severe legal actions as the content of the Constitution concerned touches on the Parliamentary Privileges Act, and it can open prison gates for you,” he noted. ‘Although the 19th Amendment was brought in by so called constitutional experts, who later became MPs, who burnt so much of midnight oil to scrap President Maithripala Sirisena’s executive powers to make him a nominal executive, the 19th Amendment does not have any bearing on the President’s powers as regards summoning, proroguing or dissolving Parliament,” he emphasised. “If anybody plans to hold mock parliamentary sessions or monkey around the privileges of the President, they must be prevented from resorting to such actions with due respect to the Constitution,” he added.